Read eBay’s North Carolina Small Online Business Inclusive Growth Report to gain insights into the trade and growth of eBay-enabled small businesses in North Carolina and the US. The report includes an analysis of new enterprise formation on eBay compared to the traditional economy across North Carolina’s 100 counties based on their economic vitality from 2011 to 2015. 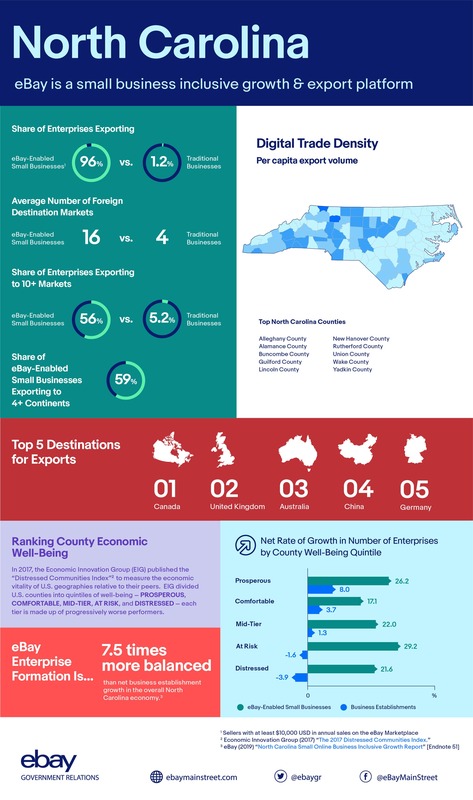 Key findings include that nearly every eBay-enabled small business in North Carolina (and the US) is an exporter reaching customers around the world, and that small business growth is more balanced and inclusive on eBay than in the traditional economy - including greater rates of growth in the less well-off counties across the state.